It’s funny how we boxing fans get so consumed with numbers. The idea that Floyd Mayweather could break Rocky Marciano’s record by fighting a 0-0 fighter has many fight fans refusing to give Floyd the recognition he is due. The name Rocky Marciano is iconic in the world of boxing. He reigned as the World Heavyweight Champion from 1952 – 1956, at a time when that truly meant something. During the peak of his career, Marciano was a living legend. He was renowned for his punching power (43 of his 49 wins came by way of KO), stamina, and rock-solid chin. He remains the only heavyweight champion to ever retire undefeated. The problem with comparing athletes from different generations is that there are just too many intangibles to keep track of. In the 1950’s, corruption in boxing was much more prevalent than it is today. Numerous boxers were directly connected to, or controlled by, organized crime. They were not protected to the degree that fighters are today. At that time, the world only recognized one champion per weight division. Unlike nowadays, when anyone who has ever put on a pair of boxing gloves seems to hold some kind of title. Today’s athletes are bigger, stronger, and faster than the athletes of yesterday. On May 6th, 1954, Sir Roger Bannister was the first human being to ever run a mile in under four minutes. Now, hundreds of track athletes run the sub-four-minute mile every year, and the same trend can be seen across almost all sports. Swimmers swim faster, jumpers jump higher, throwers throw farther. Year after year, people continue to break records. That doesn’t necessarily mean that today’s athletes are better. Training, coaching, advances in technique and equipment have also vastly improved. Also, today’s athletes are compensated as entertainers allowing them the financial freedom to train full-time. This in turn has created a larger pool of athletes to draw from than in the past. When Sir Roger Bannister broke the four-minute-mile he was a part-time athlete. His main focus at the time was Medical School. He never considered running a full-time occupation. Now, track star is a legitimate profession. Just ask Usain Bolt, who is a millionaire many times over. To be honest, taking an athlete in his prime and comparing him to an athlete from another generation seems highly implausible. Could the 195 lb Marciano of yesterday last twelve rounds against the giants of today, like Anthony Joshua or Vladimir Klitschko? Could Floyd Mayweather at his peak follow the chaotic pace of activity that his predecessors did? Would he hold up physically and mentally if his career spanned two hundred fights like that of Sugar Ray Robinson and Archie Moore? The problem with such hypothetical questions is that they generate hypothetical answers. So, is it possible to compare fighters from different generations? Yes! All we have to do is examine the numbers and do the math. The first significant number is zero. Both fighters ended their careers undefeated. Marciano retired at the age of thirty-two, while still in his prime. Mayweather, who has always kept himself in great shape, retired for the third time at the age of forty. Call it a draw. Let’s examine the numbers further. During his career Rocky Marciano defeated four Hall of Fame fighters: Joe Louis, Jersey Joe Walcott, Ezzard Charles, and Archie Moore. During Floyd’s career, he defeated one Hall of Fame fighter and six others who will most likely be enshrined within the next ten years: Arturo Gatti (inducted Dec. 10, 2012) Oscar De La Hoya, Juan Manuel Marquez, Shane Mosley, Miguel Cotto, Canelo Alvarez, and Manny Pacquiao. For those keeping score: Mayweather 7 – Marciano 4. Advantage Mayweather. If we break down these numbers even further, a lot more is revealed. Of the four Hall of Fame fighters Marciano faced, he had either an age or size advantage over all of them. He was ten years younger than both Joe Louis and Jersey Joe Walcott when they met in the ring. He also faced them literally at the end of their careers. Marciano was the last opponent that either fighter would face before retiring. In his two fights against Ezzard Charles, it was not age but size that gave him an advantage. Charles began his career as a Middleweight, moved to Light Heavyweight after the war, and then moved up to Heavyweight after failing to win the World Light Heavyweight title. Against Archie Moore, Marciano had both an advantage in age and in size. 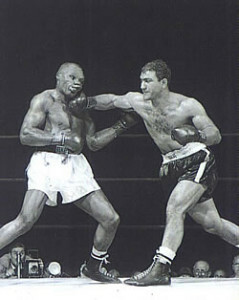 Marciano was six years younger than the thirty-eight year old Moore, who like Charles was a natural Light Heavyweight. With the exception of his bouts against an undersized Juan Manual Marquez and the worn down thirty-nine year old Shane Mosley, Floyd seemed more willing to fight his HOF worthy opponents on a more even playing field than Marciano. Against Arturo Gatti and Oscar De La Hoya, his only real advantage was his superior skill set. Unlike Marciano, Mayweather did step into the ring against younger competition. Manny Pacquio was two years younger than Floyd, Cotto three years younger and Canelo Alverez was thirteen years younger when they faced off. Once again – advantage Floyd Mayweather. Another way to compare the two fighters is to use a timeline to examine their progress and level of competition, as they climbed the ladder to boxing supremacy. #1 -both fighters started their careers facing opponents who like them, were fighting in their first ever professional bout. Both were victorious by knockout in the early rounds. #18 – in Marciano’s 18th professional fight he faced Polish fighter Harry Haft. Haft entered the ring with a 13-7 record and was knocked out in the 3rd round. Floyd Mayweather’s 18th fight saw him challenge Genaro Hernandez for the WBC Super Featherweight title. Hernandez possessed a 38-1-1 record at the time, but was stopped by Mayweather in the 8th round. #30 – victory number thirty for Marciano was a unanimous decision win over Ted Lowry; a boxer who had suffered 57 previous defeats. In comparison, Mayweather won a unanimous decision over the 35-2-2 Victoriano Sosa. #35 – saw Floyd win by TKO in six over the 56-4 Sharmba Mitchell, while Marciano won a unanimous decision over the 11-16-2 Willis Applegate. #39 – Floyd stops the undefeated Ricky Hatton (43-0) in ten rounds, while Marciano knocked out Lee Savold in six. Savold entered the ring with over 40 losses on his record as well as a draw against the previously mentioned Ted Lowry. #41 – Rocky Marciano defeated Bernie Reynolds (51-9-1) in the 3rd round by knock out. In Floyd’s 41st fight he defeated Shane Mosley (46-5) by unanimous decision. Based on each fighter’s level of competition – Floyd Mayweather once again comes out on top. Based on the math, my conclusion is this: Rocky Marciano’s legend has grown to mythical proportions over the last sixty years. However, the reality is that he built his perfect record against a number of fighters with losing records or with double-digit losses on their resume. When facing HOF level fighters, he always entered the ring with a distinct advantage. Rocky Marciano was involved in a number of mismatches throughout his career yet, every single one counted as a win on his record. Floyd was never going to lose to Connor McGregor, just as Rocky Marciano was never going to lose to a fighter with over fifty losses. Over the course of their careers, Floyd Mayweather faced a much higher level of opposition than Rocky Marciano. I’m willing to bet that those same boxing fans who refuse to acknowledge Floyd’s victory over McGregor surely would have counted the loss, had it happened. Floyd needs to be recognized and given the credit he is due. He is the new standard of excellence in boxing today. To say that he is the best of all time is debatable. To say that he is inferior to the great Marciano is not. Both Rocky “The Brockton Blockbuster” Marciano and Floyd “Money” Mayweather, Jr. retired after posting a 49-0 record. Mayweather would come back after a 23 month layoff to post his 50th win recently against amateur boxer and current MMA champion Conor McGregor 0-0. Marciano was 42-0 before getting a world heavyweight title fight stopping “Jersey” Joe Walcott in the 13th round while behind on points. He defeated former world champions Joe “The Brown Bomber” Louis prior to winning the title. He also defeated former world champion Ezzard Charles twice after winning the title. He defended his title six times before retiring in 1956 mostly due to a reported disc problem and being away from his family too much. Marciano had a limited amateur career of about 13 fights winning the NE Heavyweight title. He was inducted into the IBHOF in 1990 and the World Boxing HOF in 2010. His SD win over Roland LaStarza in 1950 was his only controversial win but in 1953 he stopped LaStarza in a title defense. “I have always adhered to two principles. The first was to train hard and get in the best possible physical condition. The second is to forget about the other fellow until you face him in the ring and the bell sounds for the fight”. The end of his life came in an airplane crash in a corn field in IA in August of 1969 at the age of 45. Marciano had his own TV show and did commercials something as far as this writer knows Mayweather hasn’t been asked to do. His arrogance may have something to do to it. Marciano was very well liked and never had a cocky attitude and reported he cried after defeating his boyhood hero Joe Louis. Mayweather, Jr. won numerous amateur titles posting an 84-6 record. At the 1996 Olympics in Atlanta, GA, he lost a controversial decision in the semi-finals receiving a Bronze medal. He would go onto win world titles starting with the WBC World Super featherweight, WBC Lightweight, Super lightweight, IBF Welterweight, and WBA/WBC Super welterweight titles. He won his first title in his eighteenth fight. Mayweather’s only controversial win was in his first fight with Jose Luis Castillo in April of 2002. In his next fight in December he defeated Castillo. In May of 2014 he fought the style that Marcos Maidana had and this writer felt it was a draw. In their return match five months later he returned to his normal style and won. He would post 21 title defenses overall. Upon retiring 13 months before coming back Mayweather seemed to finally do something out of respect to Marciano after equaling his record without going past it. The same may have gone for Welsh Italian Joe Calzaghe retiring at 46-0. Mayweather’s latest promotion for his most recent bout caused quite a stir which was probably more theatrical than on the up and up. Rumors are Mayweather may be dealing with the IRS now. His ownership of 100 automobiles worth over 15 million dollars that sit in his Las Vegas garage never driven is a big investment. He pays cash and is known to deal with one dealer in particular. He recently put up for auction the highest price automobile in the world valued at approximately 4.6 million. He is known to fly out of the country to one of the richest islands in the world and spend a bundle on jewelry. One highlight is he has sponsored Golden Glove tournaments in his former home state of MI. The comparison of Marciano to Mayweather is like night and day. Marciano’s career earnings were about $50 thousand which is what Mayweather probably uses for training expenses today. His overall assets are probably more like $600 million. WBC Minimumweight Champion Chayaphon Moosri Goes 46-0! Too many times the Thailand boxers have built up records and WBC Minimumweight champion Chayaphon Moosri at 46-0 (17), is no exception. In Moosri’s third bout he won the vacant WBC Youth title fighting an opponent who was 0-1 in March of 2007. He defended it 8 times. Several of his opponents had records of 0-0, 0-1 and 1-2. In December of 2009 he won the interim WBC International title and made 2 defenses. Then on January 2011 he won the vacant WBC International Silver title over a 7-5-2 opponent and made 3 defenses beforere-winning the vacant International title in November of 2011 making it 5 defenses. In November of 2014 Moosri wins the WBC World title from a 14-4-1 boxer from Mexico and made 6 defenses. In his 46 fights he has defeated 29 opponents with winning records and 14 with losing records along with 2 debuting opponents and a 15-15-2 opponent. Moosri is 31 and has been fighting for 10 years. His bio shows no amateur credentials. All 46 of his fights have been fought in Thailand. The WBA champion Thammanoon Niyomtrong, 15-0 (7), is also from Thailand. It would make sense for the two to meet in a unification bout. 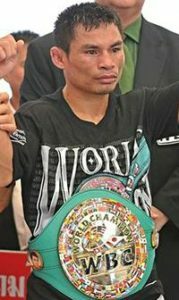 Mexico’s Jose Argumedo, 19-3-1 (11), holds the IBF titleand Japan’s Katsunari Takayama won the WBO title after losing his IBF title to Argumedo. In December of 2016 and March of 2017 (his last bout) Moosri has won 6 round decisions in order to build up his record. A world champion shouldn’t be fighting 6 round bouts. It seems he is aiming to overtake both Rocky Marciano and Floyd Mayweather’s 49-0 record. 1-7, 1-7-1, 8-16-2, 0-7 and 1-6. He never fought outside of Thailand.